The contest begins March1, 2013 and ends March 31, 2013 at 11:59 pm PST. All entries must be received by March 31, 2013 at 11:59 pm PST. The winner will be announced on or around April 2, 2013 at fancyflours.com/springpin and via email. You must be a member of Pinterest to enter. Follow us on Pinterest HERE. 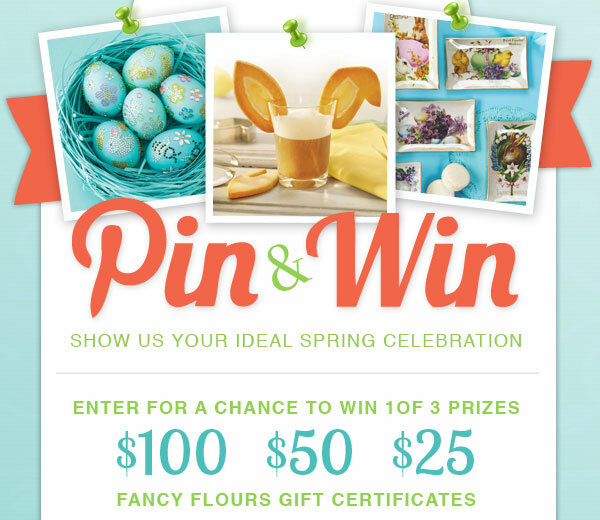 Create a new Pinterest board titled "Fancy Flours Spring Pin & Win" and repin our contest image from our "Fancy Flours Spring Pin & Win" board to your new board. Pin at least 10 Fancy Flours products or recipes from fancyflours.com that represent an ideal Spring celebration to your "Fancy Flours Spring Pin & Win" Pinterest board. Non Fancy Flours pins do not count towards your 10 pins, however they are encouraged so we can see your ideal Spring celebration. We want to see what inspires you from color schemes and tablescapes to recipes and small details that make a celebration great! When your board is ready, submit the URL of your "Fancy Flours Spring Pin & Win" Board using the form HERE. Winner selection will be selected by Fancy Flours from all qualified entries on April 2, 2013. Decision as to the selection of the winner will be at Fancy Flour's discretion based on whether or not the entrant's board is appropriately relevant to the theme, our opinion of the originality, and creativity of the board. Winner will be notified via the email provided on our entry form. 3 prizes will be awarded. The prize are one $100, one $50 and one $25, gift certificates to FancyFlours.com.